There are many options for students who either have difficulty working at a desk or just prefer to have more choices. 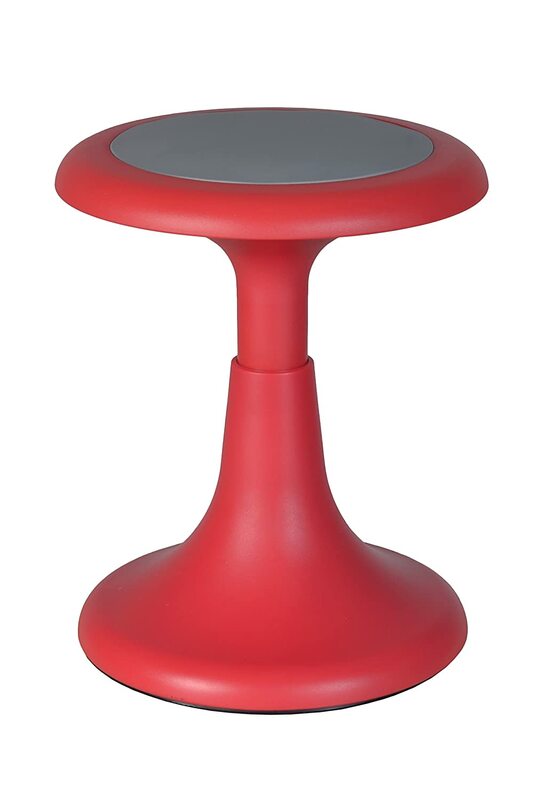 As much as possible, I allow my students to work at the carpet, outside, in our dish chair or hanging upside down so long as it helps them concentrate. In certain cases, work requires certain posture. Handwriting, for example, is always done at a desk, as posture and the position of the arm and the hand are part of the work of the child. This post is a roundup of some of the flexible seating options I’d like to be able to offer in my classroom, and why they’re attractive to me. You could say it’s a wishlist of sorts, but it’s more my findings after researching the various options online, seeing what’s offered in other Montessori classrooms, and my own personal experiences as a student. Please share any feedback! 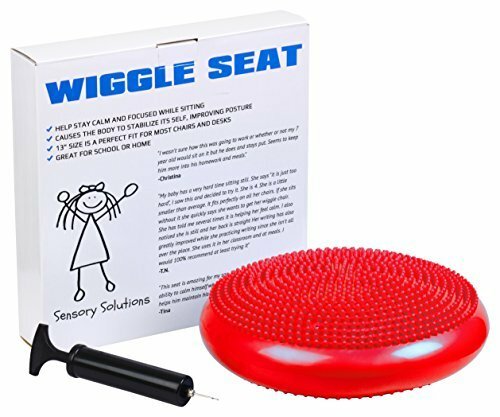 Along with my classroom, I inherited one Wiggle Seat. Through the years, it’s served me well. I’ve gone through a number of systems for having my students share it, but I’m ready to add to my collection. 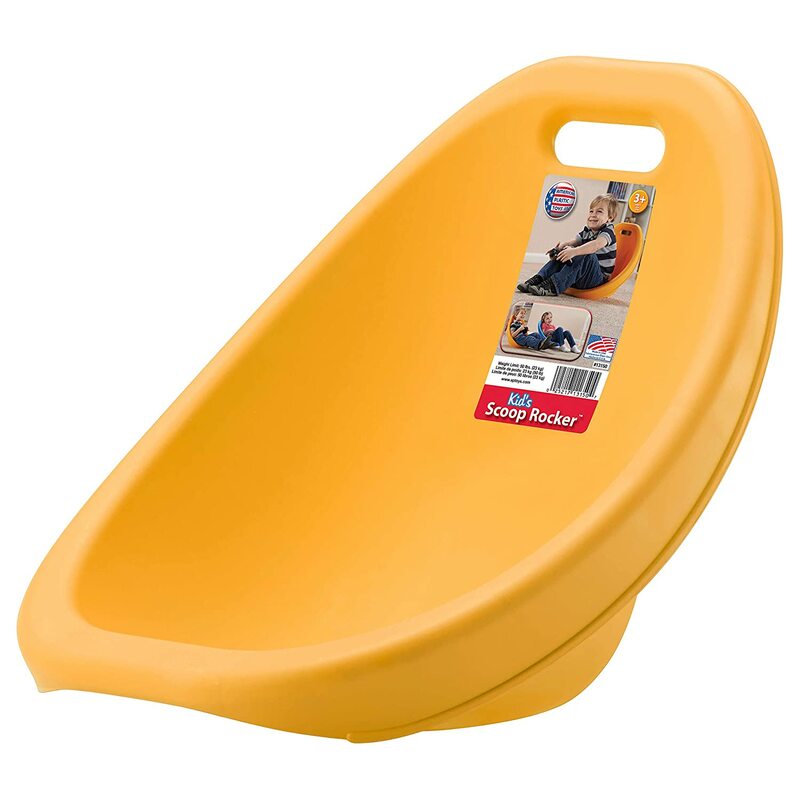 The funny thing about the Wiggle Seat is how some students ADORE it and some CANNOT STAND it, and it’s never the students I expect. 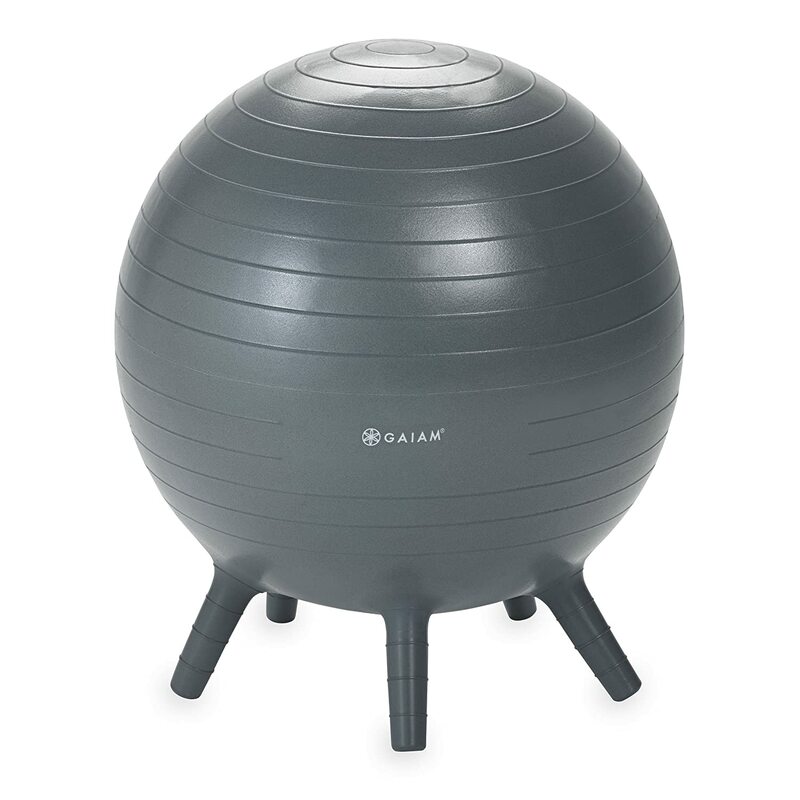 It’s also customizable–you can inflate or deflate it to the right amount of air and put the bumpy or “less bumpy” side up. I know there are classrooms with ordinary balance balls in them–my classroom will never be one of them. This five-footed adaptation is the perfect compromise. It’s bouncy, but it doesn’t roll around like its footless cousin. I imagine there’d be stiff competition over this beauty. You know those kids who lean back in their chairs no matter how many times you tell them not to? This stool is for them. It gives them 360 degree tipping power without you worrying about their heads meeting solid ground. Go ahead, Bobby. Tip away. I love Back Jacks. 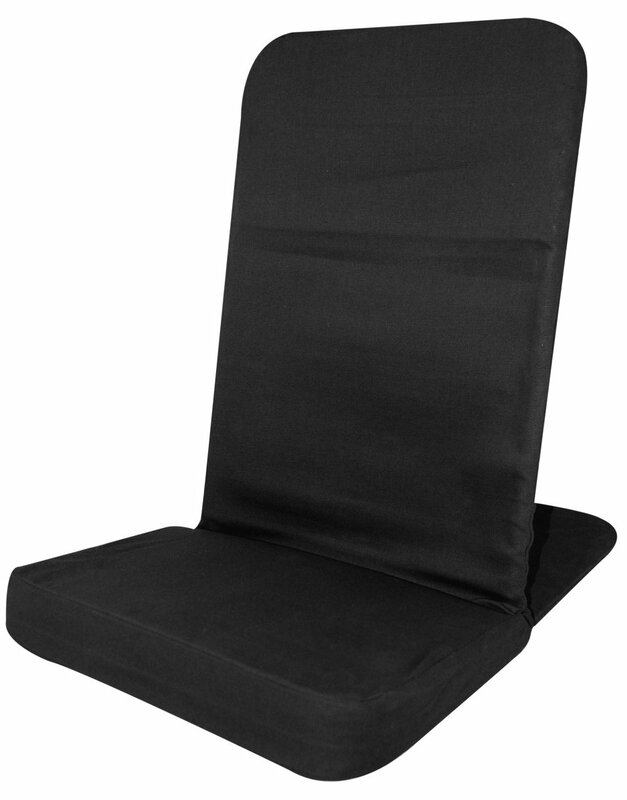 They’re absolutely perfect for floor work, especially if you need to sit for a long time. I’m someone who needs the support for their back. I personally hate stools and always sit against the wall when I teach at the carpet. Plus, having a few of them would be a great way to instantly form a small group for a lesson. As soon as I saw these rockers, I immediately pictured my students using them. Unfortunately, it appears that my older students wouldn’t fit them, so I’m looking for a larger alternative (hopefully not made of plastic). But can’t you just picture a slew of students happily rocking away in them? Yeah, me too. The opportunities don’t end there. You can include tall desks for students who prefer to stand while they work, bean bag chairs for those who want to be completely enveloped, laundry baskets and other plastic tubs for “book boats” or my personal favorite, Kinesthetic Pedal Desks. Yes, that’s right. Your students can pedal while they work. In the meantime, please make sure you stop by Room 6. Lizzy’s been hard at work making her room fit the Flexible Seating model. 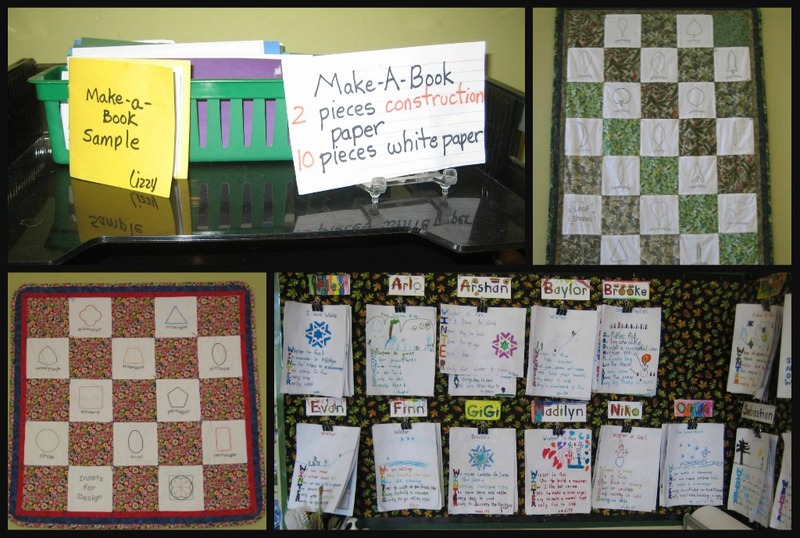 She has incorporated some of the ideas you see here, plus some ideas of her own! You might have noticed that we live in an age of accessibility, and one of the great benefits of this is the affordability of printed images. 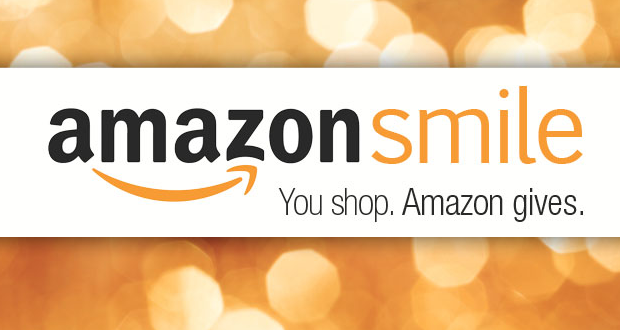 This makes it possible for almost everyone to bring art into their home or work environment without breaking the bank. And for Montessori teachers, for whom aesthetics matter greatly, this could not be better news. Lately I’ve been seeing some wonderful posters that please both visually and informationally. Other posters enhance the reading experience. Yet others draw the viewer into the subject more thoroughly than they ever knew possible. I hope you’ll find something that draws you in, too! I recently discovered Pop Chart Lab on a trip to New York. They specialize in infographic-style images (a visual compendium of all the wands in Harry Potter! Every shoe that Carrie Bradshaw ever wore! ), but some of their posters draw the viewer in so that you might never leave. Once you start exploring the Parts of Speech on this poster, you may never stop reading! And if you’re looking for a way to make those Language lessons relevant to your students, look no further! From Darth Vader to Severus Snape, this Pop Culture Primer on Parts of Speech (also from Pop Chart Lab) has got you covered! With striking visuals, this Elements of a Novel set helps to explain what makes great fiction. I love the moody visuals used in the set, and also the fact that each element uses a different work of fiction as an example. These posters feel like just the thing to pique the interest of a reader. Or, well, me. These simplified Ocean, Earth, Atmosphere and Space posters are helpful for understanding those larger-than-life concepts, and also echo the universe’s tendency to repeat patterns. Who doesn’t love a chance to celebrate Women in Science? Each of these images is available as a separate poster, but I like the way they look as a group. 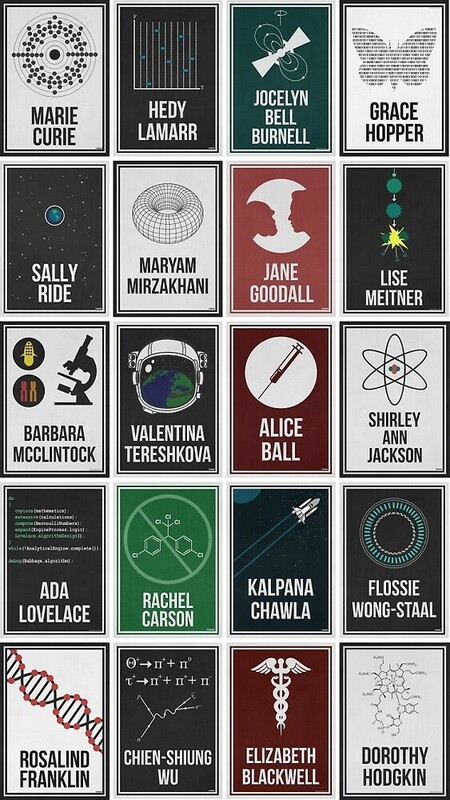 Couple with some simple imagery to represent each woman’s scientific contribution, these posters do their job–invite the viewer in and engage their curiosity. Who was Rosalind Franklin and why does her poster have strand of DNA on it? 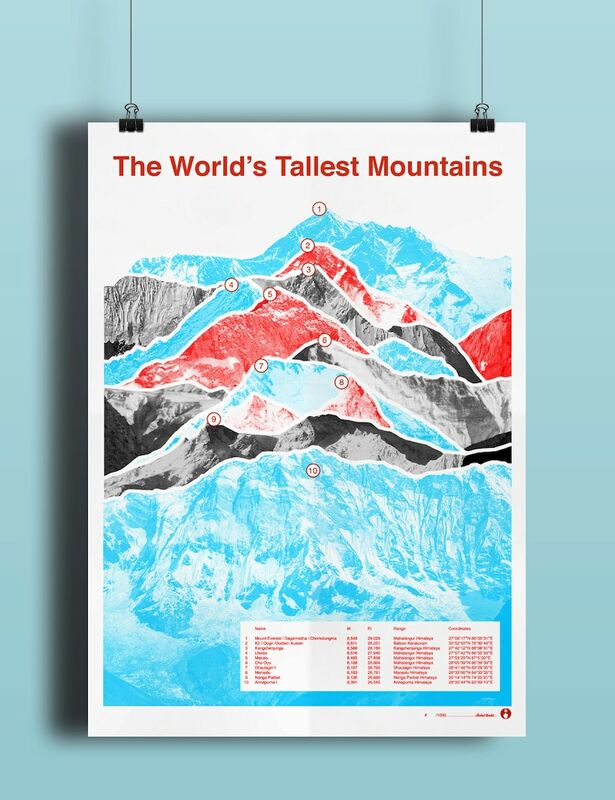 I love the way this poster overlaps the world’s ten tallest mountains. And if there’s anything that my students get impressed by, it’s superlatives. This artist also does the world’s longest rivers. 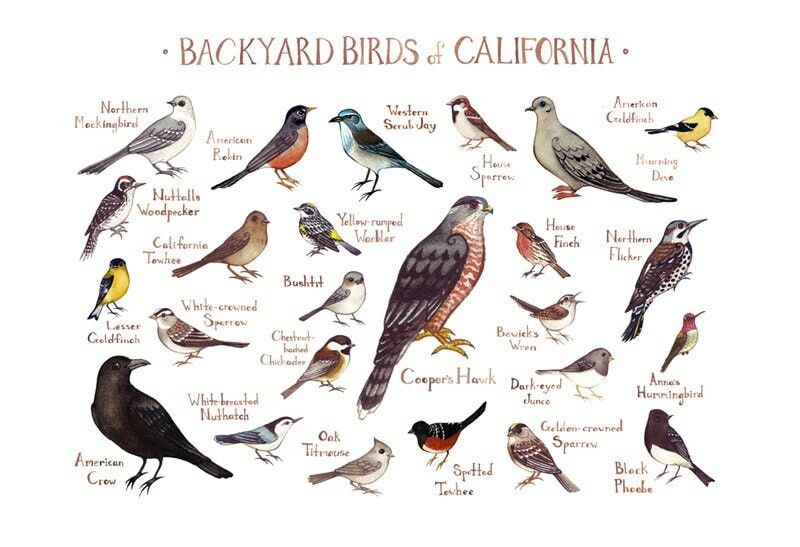 These charming bird guides are available for the United States and Canada. I usually have a bird guide and binoculars in the classroom, but this poster is a nice alternative. The watercolor paintings are sweet, realistic and labelled. Students would love to spot their living counterparts. As an avid reader, I’m a huge fan of the new trend in literary travel posters. These artworks allow viewers to travel to Narnia, Wonderland, Hobbiton, Neverland and Oz. I’m particularly partial to Steve Thomas, whose Lord of the Rings posters aren’t to be missed. 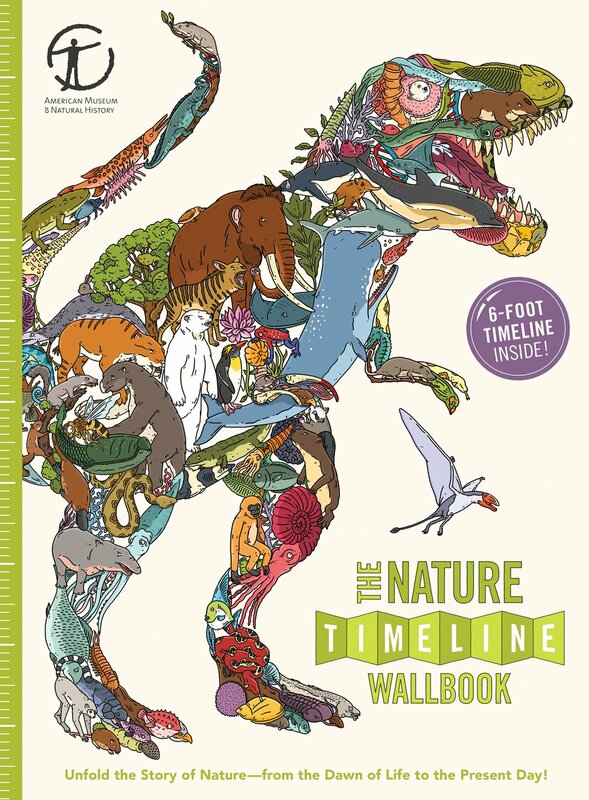 The best thing about each of these posters is that they would look equally as attractive in your classroom as in your home. And since your classroom is your second home, these posters are worth the investment! Monday, January 18, was Martin Luther King, Jr., Day. At MSO, we had the day off, but my high school Western Civilization teacher’s words ring eternally in my ears. Dr. King would’ve preferred to be commemorated by a day on. I think that to limit the discussion of Dr. King to the Civil Rights movement is to misunderstand him. It’s not just a story of African-American injustice, but of all injustice, of intolerance in all its forms, and of fighting wrongs wherever you see them. How does education establish lasting peace? I’m not sure all education does, but I do think that’s what Montessorians mean when we talk about teaching the whole child. We know that the role of the teacher isn’t simply to impart knowledge. Education isn’t a download of information. It’s comprehension, application…all that Bloom’s Taxonomy and Higher Order Thinking Skills. When students play an active part in their education, when they are encouraged to explain their thoughts, there’s less room for prejudice. It’s harder for intolerance to stand up against critical thinking. In Montessori classrooms, children practice and learn lessons of patience, tolerance and peaceful interactions from the onset of their experience. 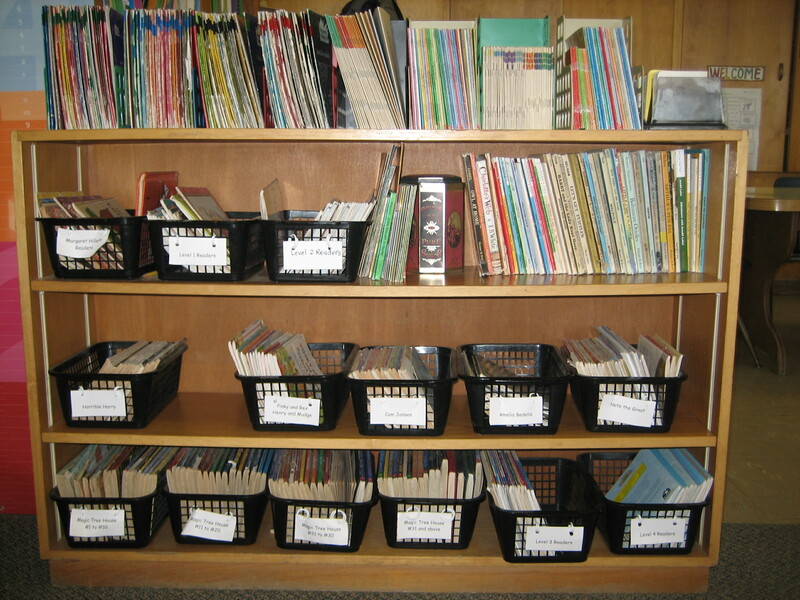 They learn to take turns with the work on the shelves and respect their classmates’ efforts at the same time. This foundation exemplifies Dr. Montessori’s emphasis on establishing a strong foundation of peace education. 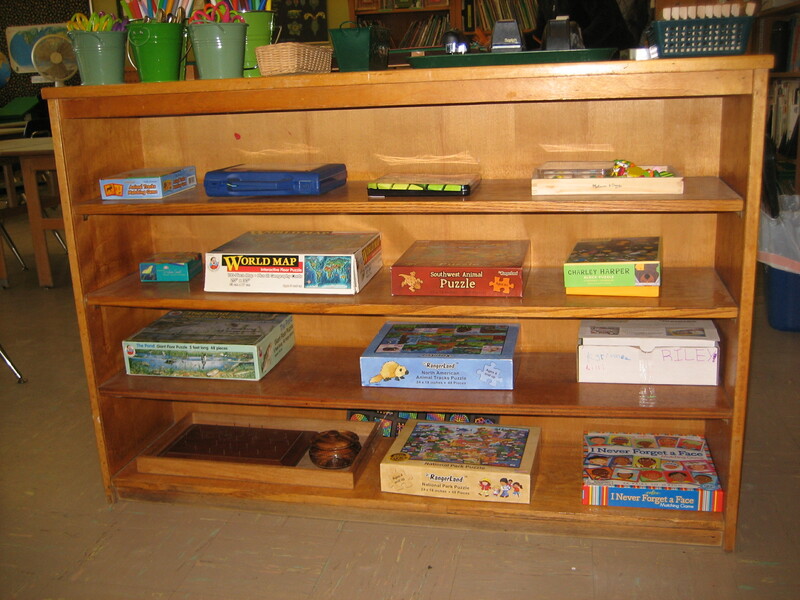 Conflict resolution and Peace Corners (or tables) are also important aspects of the Montessori classroom. In Early Childhood Montessori Classrooms children learn from their first experiences that peaceful interaction is a priority. The teacher models and practices conflict resolution with the children throughout the day. Additionally, the concepts of making, learning and reinforcing peace takes a physical form through the establishment of a Peace Corner or table. The children are encouraged to practice individually and with each other. in a variety of forms through the rich curriculum. 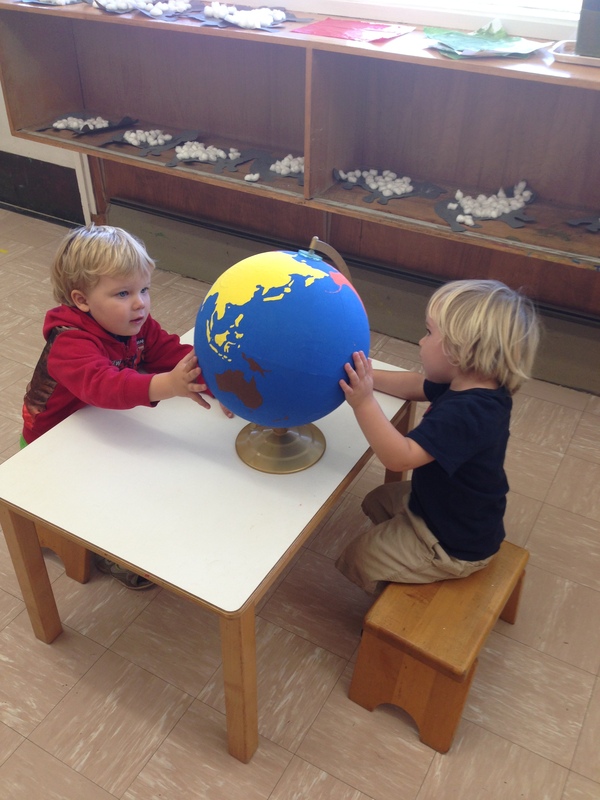 Cultural Studies are an integral part of any Montessori classroom. The more we learn about other cultures, the less we have to fear from the unknown–and the more tolerance we learn. We also learn about peace through studying the work of the United Nations, participating in the Montessori Model UN program and celebrating the International Day of Peace. Education about peace is not something that can occur once a year, it needs to be integrated as a way of life in order for children to emerge as peaceful citizens and leaders. In the Sensorial Activities, the Three Stage Lesson is used to teach the names of qualities and their various degrees. For Practical and Cultural Activities, it is used to introduce the names of the implements and materials the child is using. The Three Stage Lesson occurs in the Mathematics Activities when the child learns the names of symbols used to represent quantities and functions. For the language activities, it is used to help the child associate written symbols with sounds, and in certain exercises, to increase the child’s vocabulary. Gettman, David. 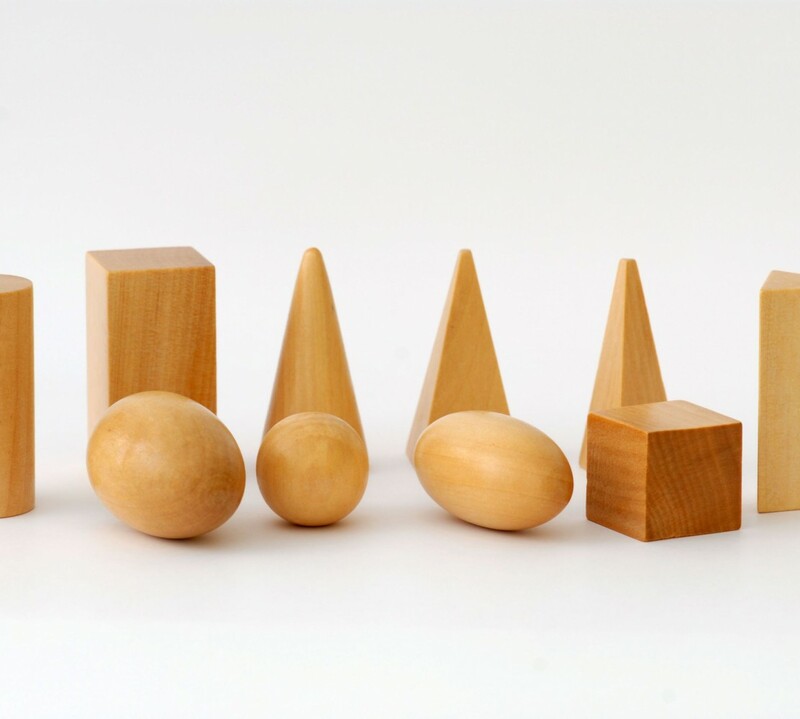 “Sensorial Activities.” Basic Montessori: Learning Activities for Under-fives. New York: St. Martin’s, 1987. 69-70. Print. The Three Period Lesson–which is how I’ll refer to it, since that what I learned to call it–is generally a presentation of three objects, symbols or qualities (at this point I’ll simplify by assuming objects). At a minimum, for the sake of contrast, at least two objects need to be presented. Sometimes four objects will be appropriate. With elementary students, four to six objects may be introduced. Working with the students (giving the lesson) is our guide to determining the number that best suits them. Isolation is also key when giving a Three-Period Lesson. We present the objects on an empty mat or a clear table. Similarly, we keep our language simple and limited. The vocabulary we’re trying to introduce can easily become lost in extraneous explanations. With younger children, Three Period Lessons are generally one-to-one. In Elementary, teachers may introduce vocabulary individually or in small groups. 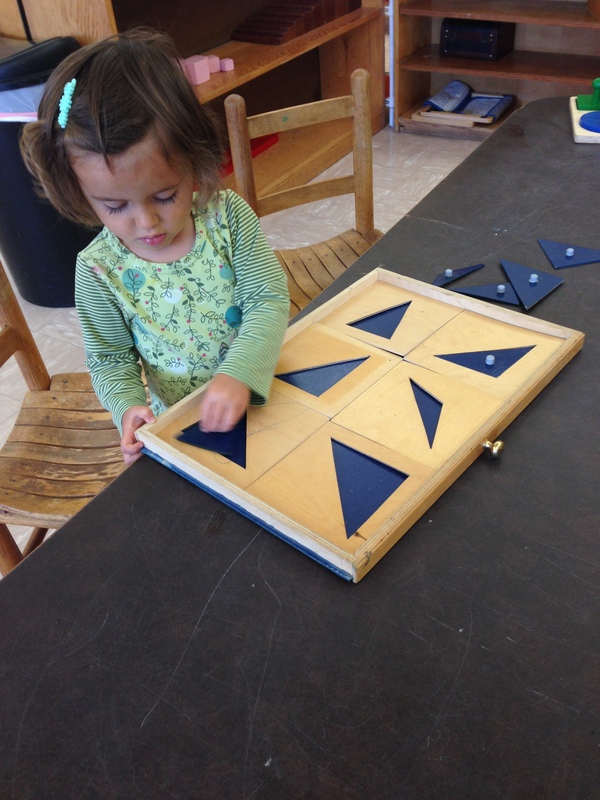 In fact, I think if you were to observe a Montessori classroom, you’d see the influence the Three Period Lesson has much of our work with students, from worksheets, to our approach to error-handling. Now that we have the foundation for the Three Period Lesson, we can begin! Again, for simplicity’s sake, I’m going to assume in further descriptions, that I’m giving a Three Period Lesson with an object. The First Period is where the name and and the object are first associated. The teacher sits down with the student (beside him or her, not across) and introduces the lesson. “Today we’re going to work with some shapes.” Then, moving the object in front of the child, the teacher gives the name, repeating it clearly, enunciating each sound: “This is a triangle. Triangle. Triangle.” If the object is a sandpaper numeral or letter, the teacher should demonstrate how to trace the character; where to start and how many fingers to use. After demonstrating, the teacher can invite the child to feel the object, too. These steps are repeated with each object we’re introducing in the lesson. It’s important to note, however, that the student doesn’t have to say anything during the first period. We notice spontaneous participation (such as repeating the name after we say it), but don’t require it. In the Second Period, the teacher checks to see if the student has remembered the connection between the objects and their names. Even if the student said the names during the First Period, we want to know they weren’t just parroting what they heard. According to Dr. Montessori, the Second Period is the most important because it is the the “test” of knowledge (p. 157, The Discovery of the Child). To do the checking, the teacher places all of the objects presented in the First Period in front of the student. “Show me the triangle,” the teacher will say. Or, “Point to the square.” If the child doesn’t know, we have two options: Put the lesson away or go through all the objects a few times to see if this was just an accident or a true mistake. Generally speaking, our knowledge of the child and our instincts will help you make this decision. Remember, we’re observers and we’re watching for signs that they’re just guessing. If the errors are being made because the student is inattentive to the lesson, it’s time to set the material aside. The time isn’t right! If it’s a true mistake, we know we need to put the lesson away for another day. As in all things, we must make sure not to show disappointment or disapproval. If the student is successful with the Second Period, we can move on to the Third. The Third Period is the only part of the Three Period Lesson where the child is asked to speak. They might volunteer words or phrases in earlier parts of the lesson, but it’s important not to require anything until now. During the Third Period, the teacher will isolate one object from the lesson and place it in front of the student. With the object isolated, the teacher will ask the student to name it. For example, the teacher will place the circle in front of the child and say, “Tell me the name of this shape.” If the student’s pronunciation is off, we help the child. You might have them repeat the word until they can say it correctly. However, it’s worth mentioning that difficulties with pronunciation and difficulties with identification can be two separate issues. As with many tasks in the Montessori Method, repetition is important. As teachers, we may give the same lesson multiple times. We may repeat the entire Three Period Lesson, or any of the three stages, depending on what we feel will benefit our students. It’s also helpful to give a short summary of the lesson, as you’ll see in the video below. When the teacher and student have completed all Three Stages of the lesson, the teacher can say, “Today, we worked with the circle,” (placing the circle in front of the child), “the triangle,” (placing the triangle next to the circle), “and the square” (placing the last shape on the table). This quick recap completes the work cycle. Homfray, Margaret. “Introducing Terminology with the Use of the Three Period Lesson.” YouTube. Skyincolor. Web. 4 Oct. 2015. Lillard, Paula Polk. 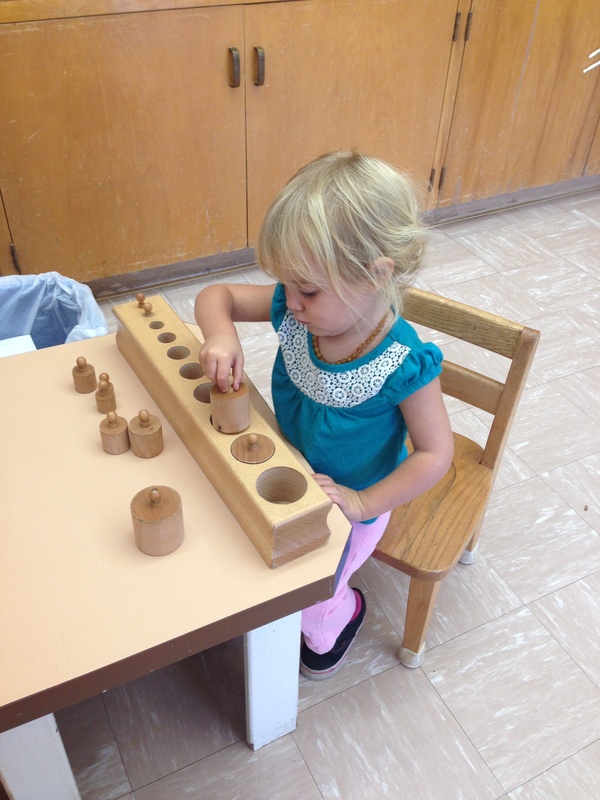 “The Montessori Method.” Montessori, a Modern Approach. New York: Schocken, 1972. 69-70. Print. Hainstock, Elizabeth G. “The Sensorial Situation.” Teaching Montessori in the Home: The Pre-school Years. New Updated ed. New York: Plume, 1997. 48. Print. Montessori, Maria. “The Technique of the Lessons.” The Discovery of the Child. New York: Ballantine, 1972. 156-158. Print. Montessori, Maria, and M. Joseph Costelloe. “The Education of the Child.” The Secret of Childhood. New York: Ballantine, 1972. 110. Print. In fact, the classroom is as much the child’s instructor as the Montessori teacher is–as the material is–and we give it as much care and attention as we might our own homes. Since the classroom is the child’s place (his second home as well as ours), we must take him into consideration as we prepare it. 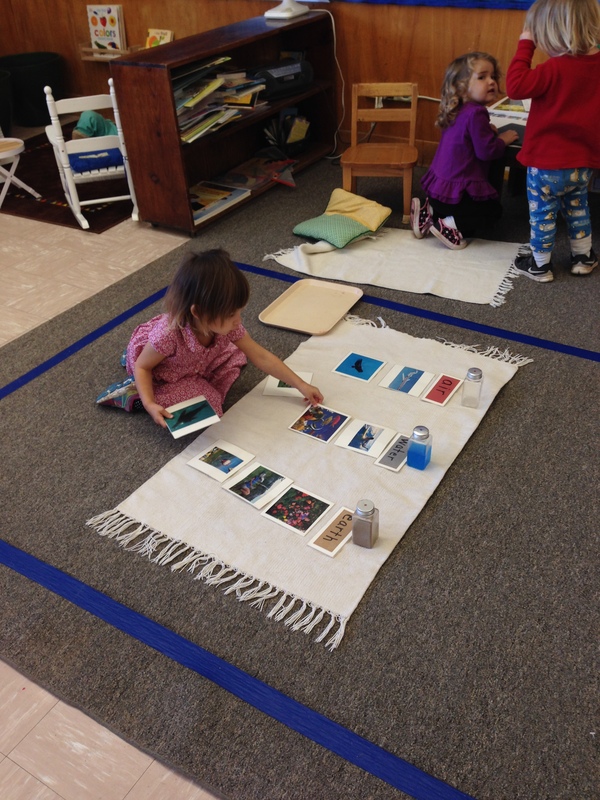 In keeping with the Montessori Method, there are six elements to a Montessori classroom, each of which I’ll try to touch on today: Freedom, Structure and Order, Nature and Reality, the Montessori Material, Beauty, and Community. In a classroom where the material is both accessible and appropriate, students can work and move freely. The space to move, to choose one’s own work, and the opportunity to visit the outdoors are deemed essential. 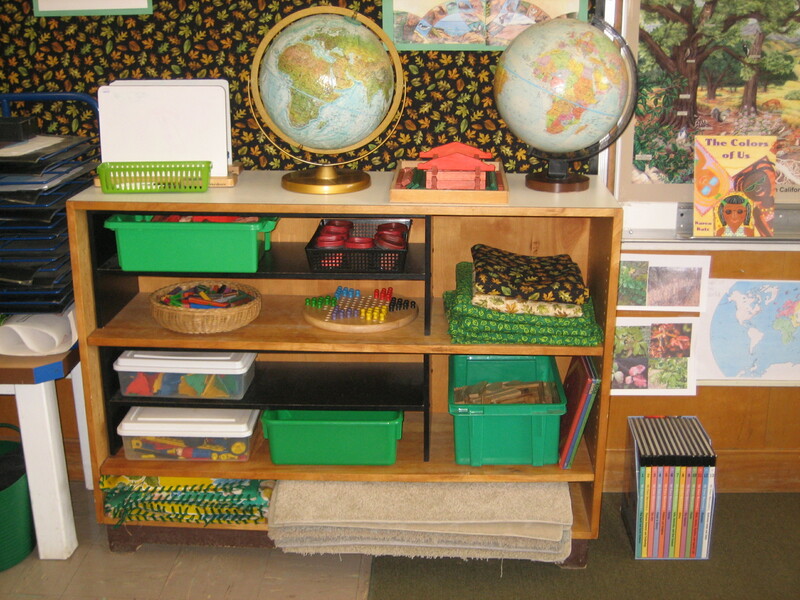 If you’ve already visited a Montessori classroom, you’ll notice that the furniture is child-sized. The student’s feet can touch the ground instead of dangling in midair. Brooms fit small hands. Scissors are made for little fingers. With appropriately sized material made accessible to them, students can interact with their environment. Montessori, Maria. “Spontaneous Activity in Education.” The Project Gutenberg. Project Gutenberg, 2 Mar. 2008. Web. 5 Sept. 2015. The emphasis we place on the child’s ability to do for himself, in turn, helps with the greater goal of teaching independence. Within each area, work is arranged by level of difficulty. On a Practical Life shelf, for example, there may be three pouring works: Pouring rice from one vessel to another, then a similar activity with colored water and, finally, a more challenging pouring option involving a water pitcher and three small glasses. 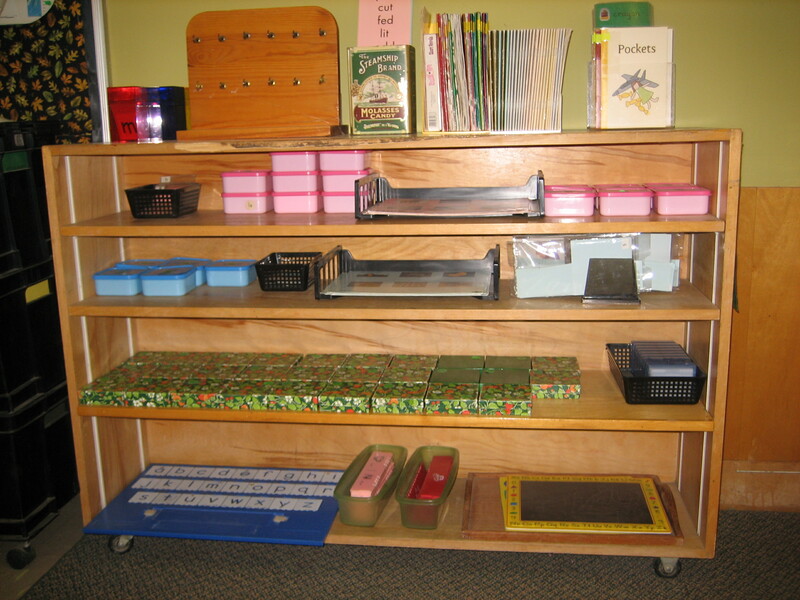 Color-coding is another tool used in the Montessori classroom. 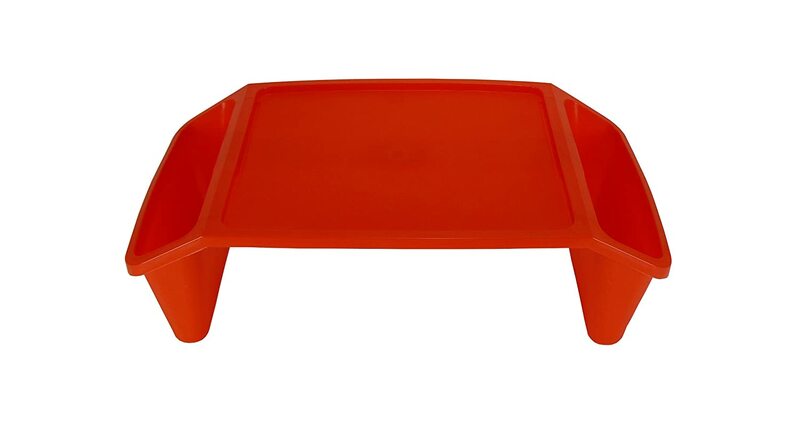 When the child knows that the red sponge goes with the red tray, he can take greater responsibility for putting his work back on the shelf the way he found it. If a material isn’t attractive to the children, the Montessori teacher will replace it with something new. If that material doesn’t interest them, this cycle will repeat itself until the teacher finds the work that best fits the students’ needs. Shelf work is more static and sees fewer changes at the elementary level, but the principal of attractiveness remains constant. Attractiveness is another important element in the Montessori classroom. Beauty invites the students and welcomes them to learn. No chintz involved–I promise! Here, beauty is more closely allied with simplicity. A lack of clutter is just as important as the use of natural materials like wood. Beauty invites the children to learn, just as it makes them feel welcome. 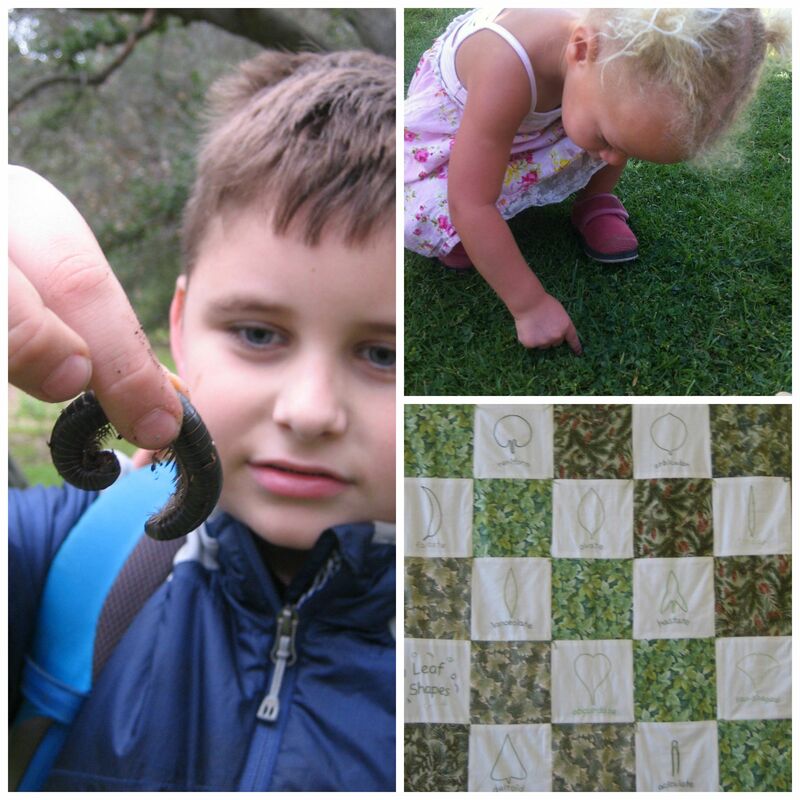 Montessori classrooms are also designed to bring the children into contact with nature and reality. Using breakable containers (like glass) allows students to learn to handle materials with greater care. Lightweight tables remind students that absentminded movements can disrupt a quiet classroom or the work of a fellow classmate. 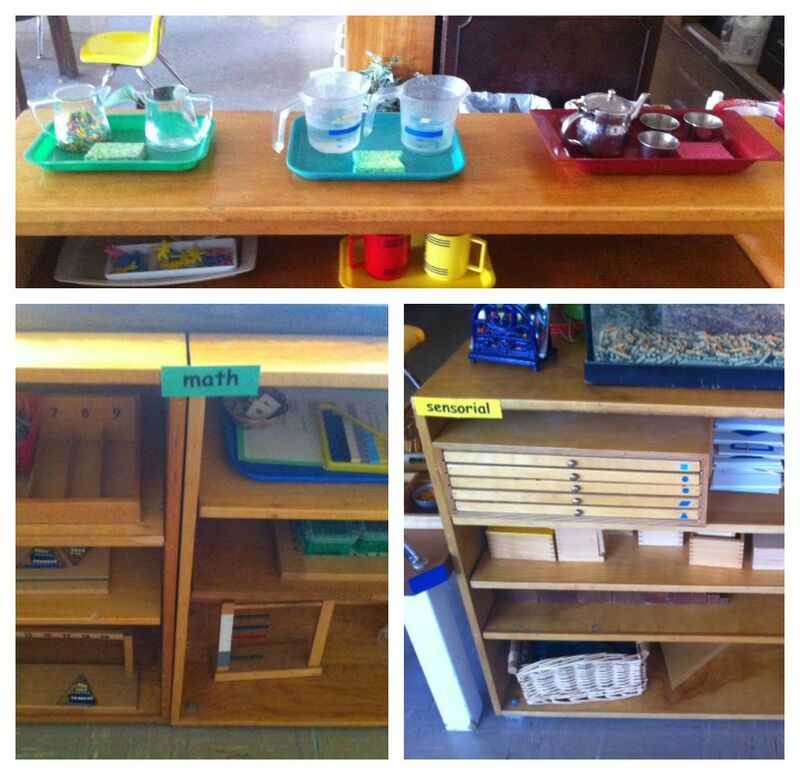 Another way that Montessori classrooms mimic reality is by limiting the availability of each material in the room. The ability to wait until a fellow student has finished with a work is an invaluable life skill. It also helps to create an atmosphere of respect in the classroom. It emphasizes that each child’s work and work time is important. Finally, we make an effort to bring the beauty of nature into the classroom by bringing in living things (plants and animals) inside and also by taking the students to experience the natural world out of doors. They’re designed to stimulate the student’s natural desire to learn, and to encourage concentration. They should have a Control of Error. That is, there should be some way for the students to see their own mistakes and have the opportunity to correct them. This allows students to teach themselves. There’s a Sensitive Period–a developmental “sweet spot”–for introducing each material. Materials move from concrete to abstract. Many materials are designed to provide foundation for later work. An example of this is insets, which strengthen the fine motor skills necessary for letter formation. 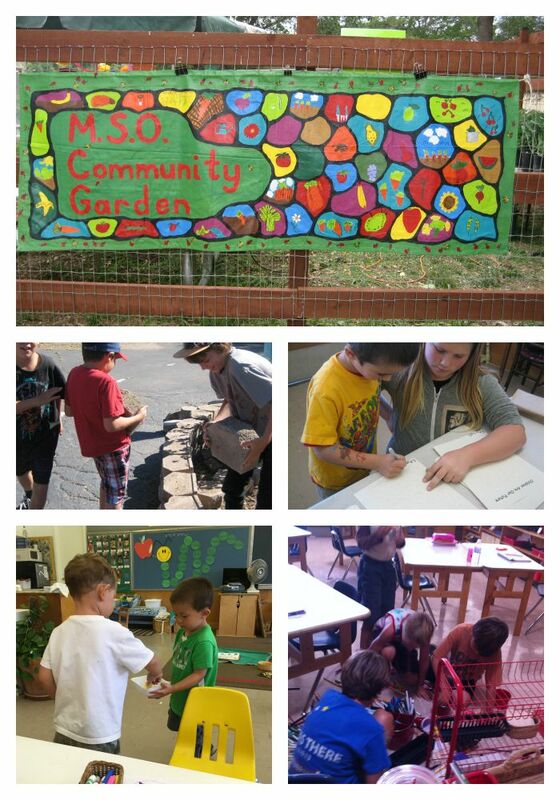 Clockwise, from the top: The community-made banner for our school’s Community Garden, Mixed ages, students helping to tidy a classroom mess, a student sharing snack with his classmate, and students helping with a school beautification project. 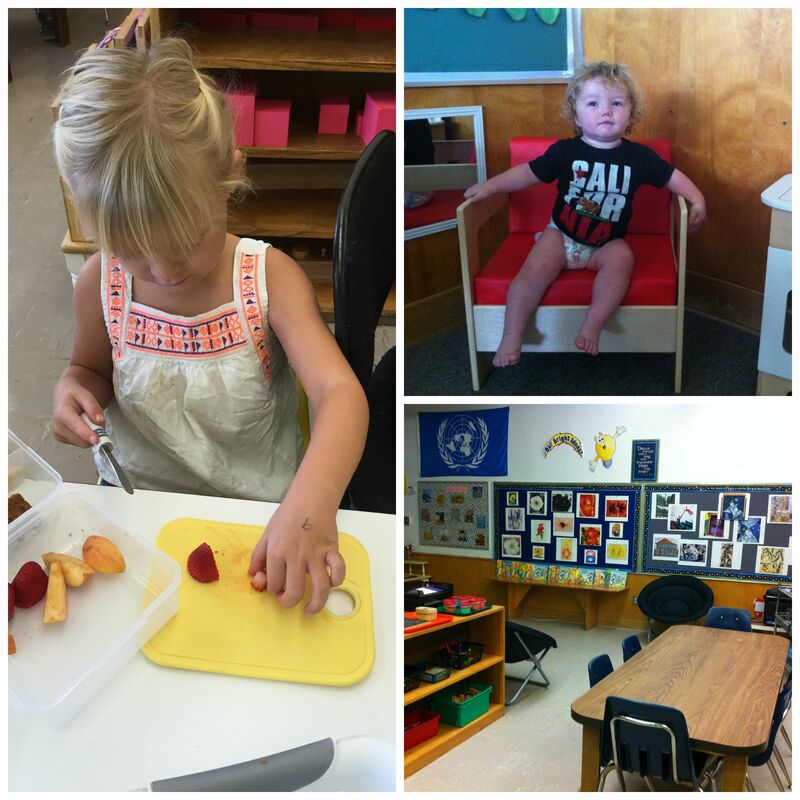 In Montessori schools, we encourage the students to take ownership of the classroom. It’s their space, and that means they’re involved in the care and keeping of it. This is why you’ll often see Montessori students cleaning tables or even picking up trash around campus. We encourage the students to think of the school as shared space–because it is! Caring for each other is also part of the Montessori classroom. Helping their peers comes spontaneously to most children and it’s additionally fostered by our mixed ages. Teaching the younger children benefits more than just those receiving the lessons. It is, after all, through teaching, that the student best reinforces what he’s already learned. 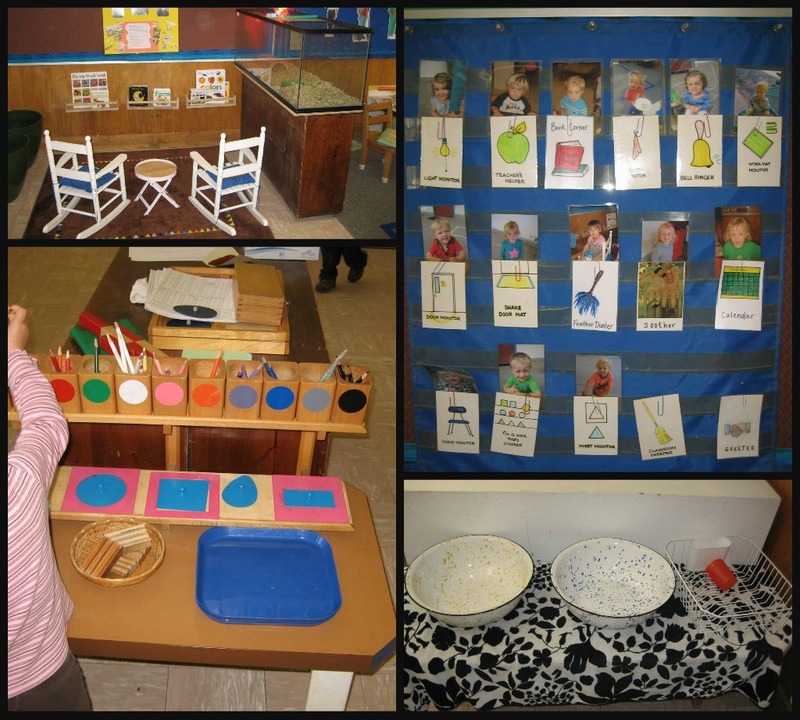 As you can see, the Prepared Environment is an integral part of the Montessori teaching philosophy. As we begin our exploration of what it means to be a part of a Montessori community, I hope you’ll begin to see our vision for education. 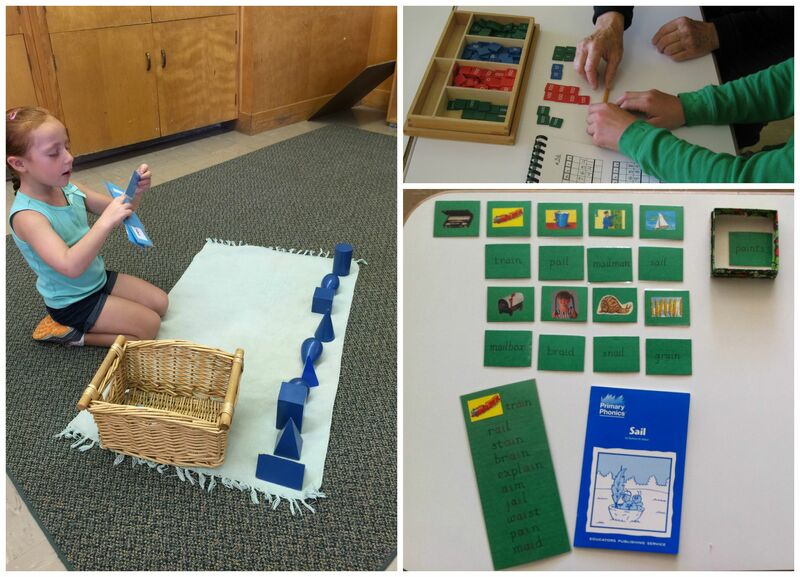 “The Six Principles of the Montessori Prepared Environment Explained.” – NAMC Montessori Teacher Training Blog. Montessori Teacher Training, 18 Mar. 2009. Web. 6 Sept. 2015. “Montessori Classroom Approach.” American Montessori Society. Web. 6 Sept. 2015. Lillard, Paula Polk. 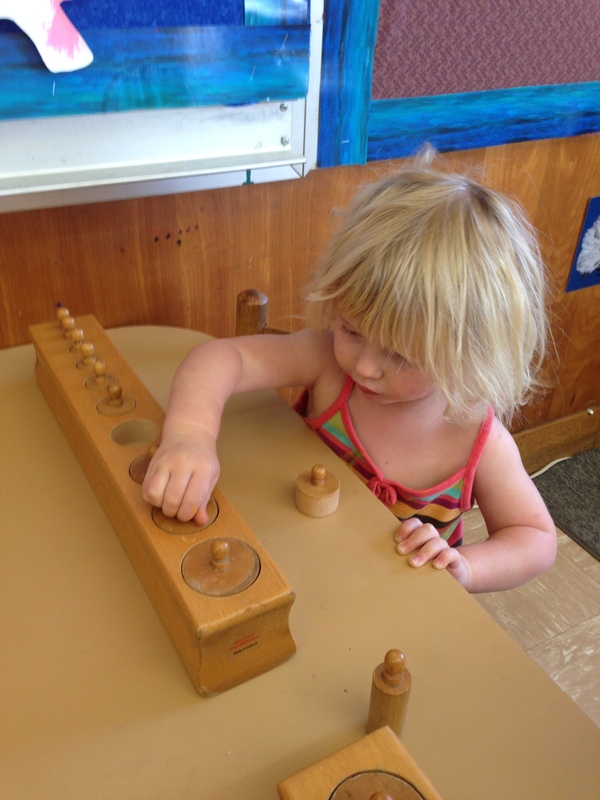 “The Montessori Method.” Montessori, a Modern Approach. New York: Schocken, 1972. Print. Over the next couple of weeks, I’ll be shifting my focus a bit closer to home as I profile each of the classrooms at my wonderful home away from home, The Montessori School of Ojai. Along with photographs of each classroom, the students in action, and a peep into the daily schedule of each of class, you’ll also be treated to a brief Q&A with the head teacher. 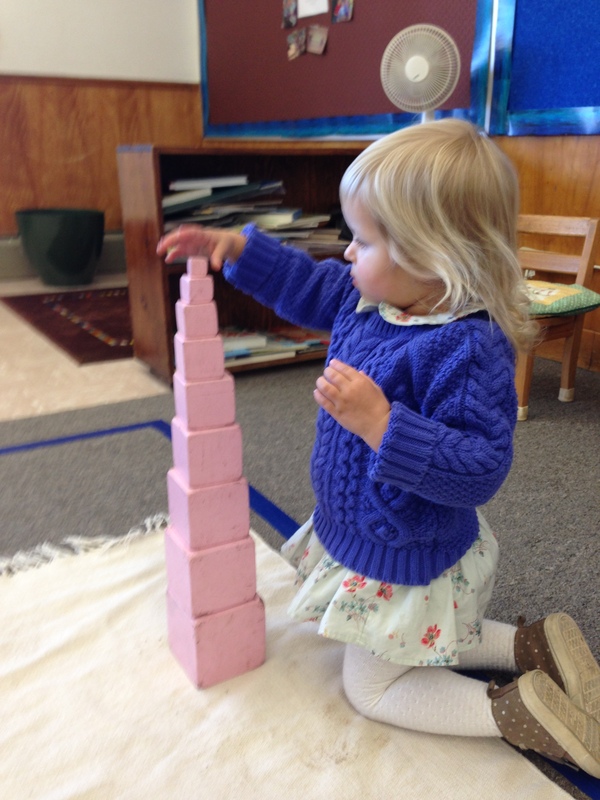 Jenny received her own early education at Montessori School of Ojai. After attending Chico State University, Jenny returned to Ojai and came to work first in the Child Care program and then as an assistant, while pursuing her Child Development Education. She has completed Montessori Teacher Training under Dr. Victoria Matthews and Montessori Infant Teacher Training and the Preschool-Kindergarten Teacher Training Courses through the North American Montessori Center. She has worked with every age group at the school, but her love of infants inspired her to be instrumental in the development and start of the Infant Program at MSO. Jenny serves as a Montessori Teacher Trainer. What does the school day look like in Room 3? Room 3 is always a hive of activity. Children come in the morning and find work. I feel that the children in my room are eager to find work right away. They are excited to explore the room and help me create new works. When they are done eating snack, they discard the snack they don’t want, pour the water into our water bucket, then they wash their own dishes. The contents of the water bucket are used by the plant monitor to water the classroom plants. When we line up to go outside, we go over who is here and who is not so the children are involved in learning about the children in their classroom. Group is a time when we can go over our unit, read stories and sing songs. 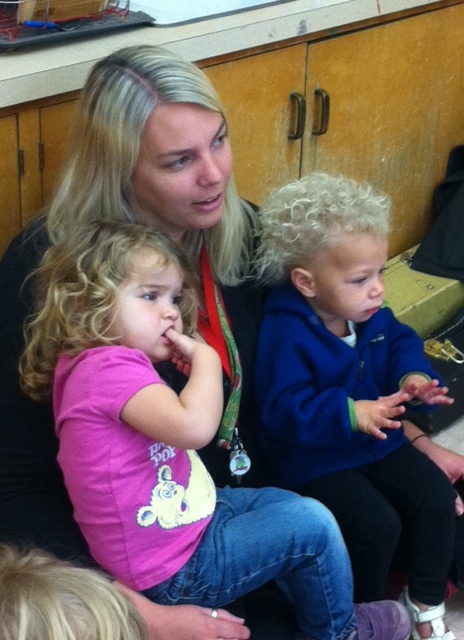 We also end our day with a song so the children know its nap time or time to go home! 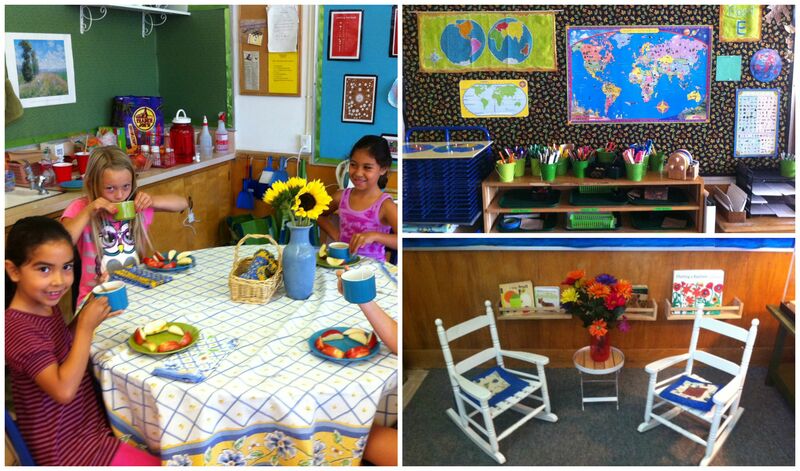 What’s your favorite area of your classroom? I love the Science and Geography area! 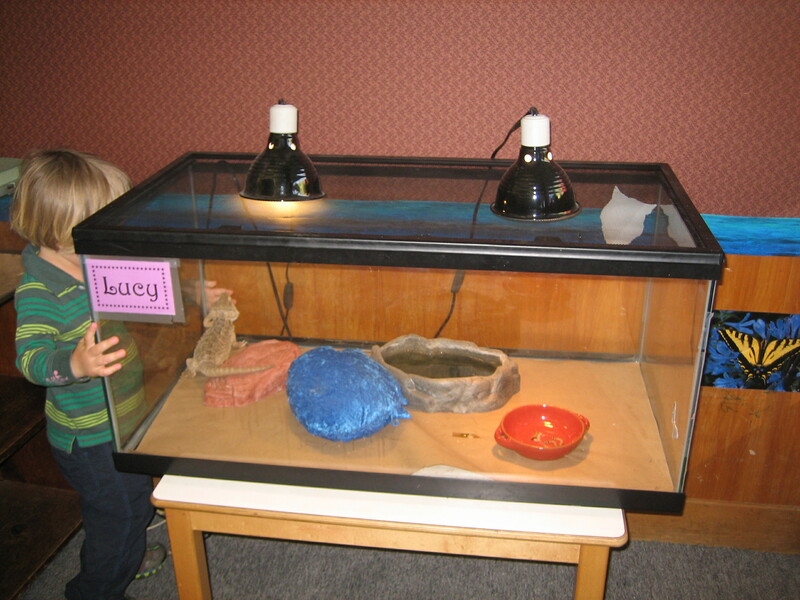 Lucy, our Bearded Dragon is there! I enjoy Science and Geography because the world fascinates me. I feel this age group is really into learning about the world around them. If you were a student, which work would you choose first? Hands down, I’d choose the Knobbed Cylinders! Knobbed cylinders have been my favorite work since I was a little girl at MSO. They are very calming but also challenging when you are doing more than one block. What do you find gives your students the most internal satisfaction? When they complete a specific task? When they help others? When they do their classroom job? I notice that my students receive the most internal satisfaction when they a complete task like one of their works or their classroom job. I call it the internal smile coming through. The pride on a child’s face when they complete a task is breathtaking. You truly can see the warmth of the child come through. My kids are amazing! What do you bring to your classroom? Your enthusiasm? Your love of learning? Your large heart? I bring my loving enthusiasm to the room. The children allow me to bring out my creative side and explore different ways to teach the children. I also bring a respect for the children to my classroom. They are awesome little humans that need respect just like everyone. 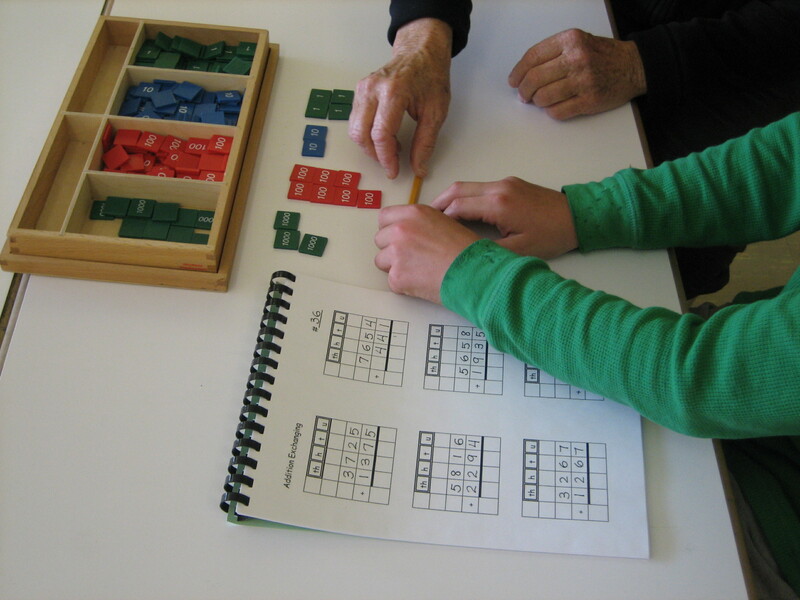 What about the Montessori teaching philosophy most speaks to you as a teacher? I love that we teach individually. Every child is different, so every child learns differently. I like figuring out how each child learns and functions. It’s exciting to figure out how each child sees the world. I just feel lucky that I was raised in a Montessori world and I can help other children see the world how they need/want to see the world. 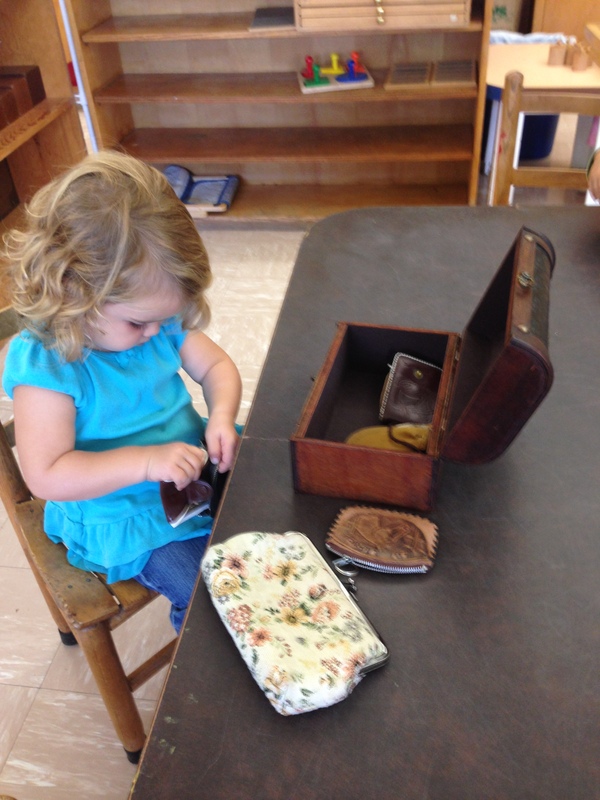 What is the most important thing for parents to understand about Montessori schools? Not all Montessori schools are the same. The philosophy is the same but how you interpret it can be different. Maria Montessori was a pioneer for both women and children. With her philosophy the world changed. We started to understand the importance of children. 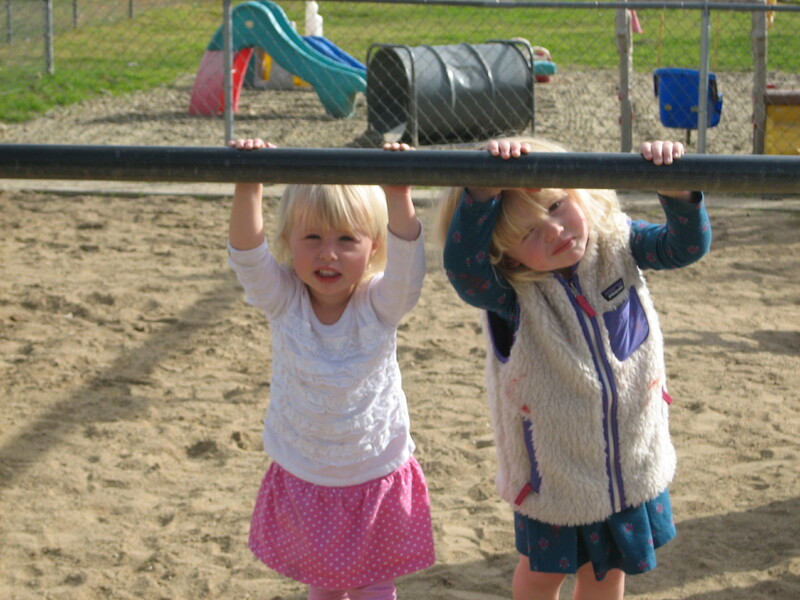 Montessori schools try to create individuals and the whole child. If money, time and energy were no object, what would you want most for your classroom and your students? The school? I would love it if town (Ojai) were closer to us because there are so many places to explore and take the children. It’s hard to pack up my classroom and go on field trips with all the car seats. If town were closer we would be able to walk more places. I love our campus and all it has to offer, so I wouldn’t want to leave it, but I would love to move our town of Ojai to us. To keep growing as a teacher and a Montessorian. I want to continue growing. I love my job and the feeling of happiness it gives me. I want to prepare the children for the future and the challenges they might face. 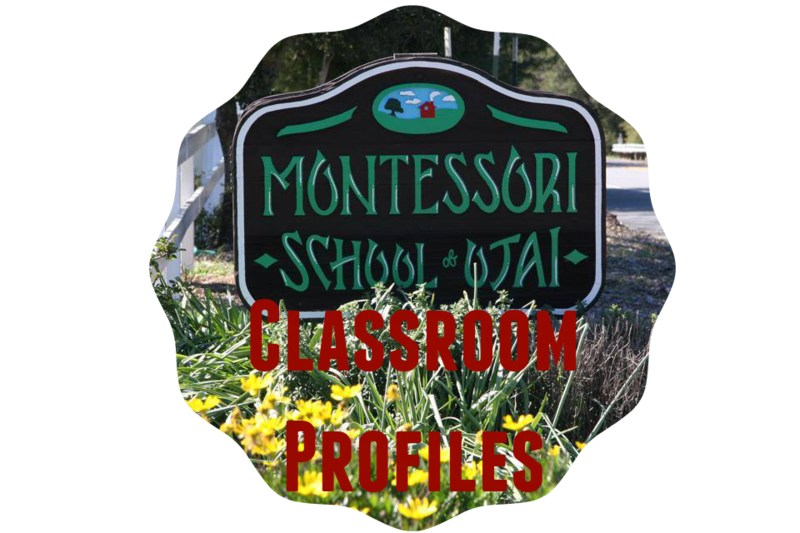 Don’t miss the other classroom profiles! 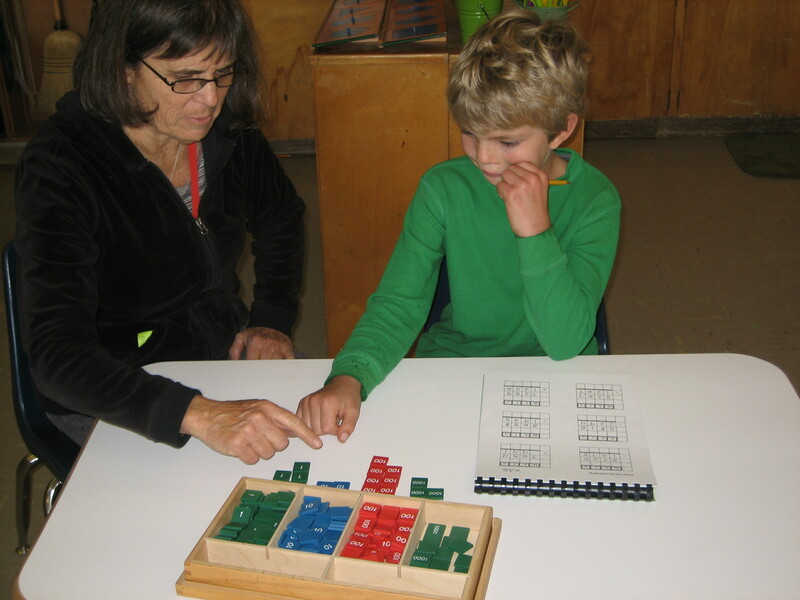 Liz has been associated with the school since 1980, starting out in the Child Care program and then assisting in the classroom while completing her Montessori training. Since obtaining her Primary and Elementary Montessori certificates, Liz has been head teacher for children from kindergarten through the third grade. She also serves as resource teacher for science and social studies. Liz’s educational background includes undergraduate work in Zoology and Botany. She has a B.A. degree in Psychology from Antioch University. She has also been a teacher trainer for Mortensen Math. 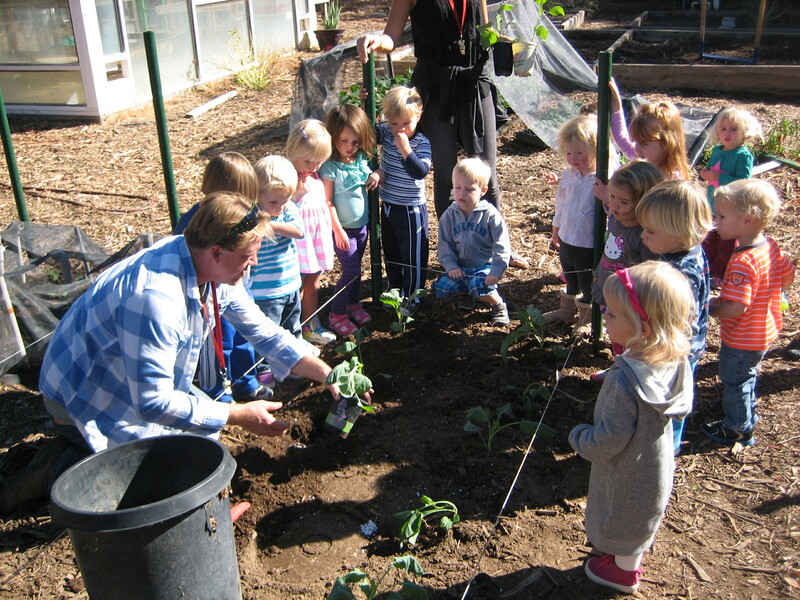 All three of Liz’s children have attended Montessori School of Ojai. What does the school day look like in Room 6? During the first hour of the day the children are quietly working and concentrating. The morning is spent doing basic skills activities. During this time of year the children have 7 different types of work to complete. Every morning there is also a specialist activity, so the children go in either half groups or whole group. The volume of noise picks up as the day proceeds as children finish tasks. I think the day goes most smoothly when we have half groups (art or garden) midmorning to wrap up the work. The afternoon is spent as a whole group, with the children listening to read aloud stories and/or the introduction of new science or cultural studies activities. love to have student work on the boards. While all the subjects are fun to teach, I particularly enjoy teaching about earth science, botany and zoology. I think Dr. Montessori was so inspired in the way she created a system of teaching, using nomenclature, that can be used with any age of child. I love making classroom materials. I would probably start with an inset. Creating a design, choosing colors and coloring are stimulating and soothing to my senses. I love the infinite possibilities, and while I am working at this, my mind naturally organizes my thoughts and direction. I think the children really light up when they master new and different levels of reading. Many love to do multiplication and especially division. They think it’s so easy. Some really enjoy learning cursive, others love to write in their journals or paragraphs. The children really love to help other children. It’s so important to provide lots of opportunities for that. Some weeks the children read with a partner, something they really enjoy. The children also love to clean classroom tables. Many of them would clean all the tables if allowed. I think I really bring enthusiasm for learning every day. I am pretty strong on having an established routine and expectations. I believe this helps children feel secure and successful. I also think I am joyful and loving about the work that I do, and that carries over in my relationships with the children. I love having an individualized work program. By this I mean that I get to figure out what levels of challenge are appropriate for each child in each area of the curriculum. I get to search for the things that light up each child. This allows for so much diversity in the room while at the same time supporting individual children as they grow and develop. It enables them to learn from each other, in a (mostly) noncompetitive atmosphere. choices all day long about what work to do, how much to apply themselves, how to pace themselves. These are lifelong skills. In terms of the school, I would love to see the grounds and building developed as an environmentally progressive whole. I love the idea of aesthetic nature-inspired teaching spaces, indoors and out. This would include a trail that meanders around undeveloped sections of the property that would incorporate native plantings, inviting involvement and raising consciousness in our children and ourselves about our roles as stewards of the earth. For the outdoors I would love to have beautiful established wooden benches from which to enjoy the beautiful grounds we are so fortunate inhabit. I also would like to see several aesthetically designed gazebos in our play yards. I think this type of structure would not only provide shade during the hot months but also encourage creative social play amongst the children. 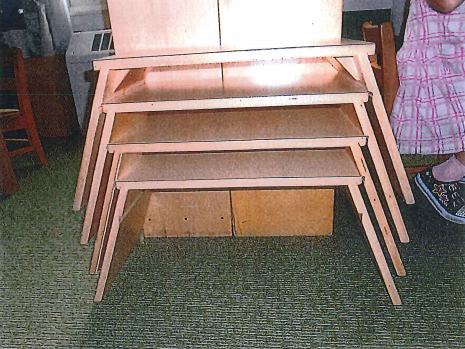 For the inside of my classroom I would dearly love some individual stackable writing desks for use in the carpet areas of the classroom. enthusiastic teacher. The real-world subject matter of our curriculum, the everyday challenge of making relationships with the students and bringing them into knowledge while fostering their love of learning are all deeply important to me. To maintain my interest and motivationI intend to continue to attend Montessori conferences, to learn from and share with other Montessorians on a national level. Other conferences, like Bioneers and the Student Climate and Conservation Congress, that encourage educating ourselves and our youth for a healthy planet are also attractive to me. In the future, when I retire from teaching, I hope to continue to be involved in nurturing an ethic of care of the earth through art.